Dear John: I enjoyed your PBS Frontline report “Climate of Doubt”. There was, however, a very obvious sleight of hand during the discussion of the decadal global temperature trends. I will address that initially in this correspondence. In addition, I’ve provided another classic example of misdirection by climate scientists, this one in a peer-reviewed paper. The discussion progresses to an easy way to tell if the Escalator graph of global surface temperatures from “Climate of Doubt” can be created with full 10-year periods for the “steps”. Last, but most important, whenever misdirection is used, people examine what’s being hidden. So please read through to the end of this discussion, because I’ll be happy to show you what the climate science community has failed to disclose. This correspondence covers a lot of material, and some of it will likely be new to you, so take your time with it. As noted at the end of this discussion, if you have any questions, feel free to ask them at my blog. You’re probably wondering who I am. I am one of a handful of independent researchers who study the warming of the global oceans. For the past 4 to 5 years, I have been investigating, very intensely, sea surface temperature and ocean heat content data, and I have presented my findings in hundreds of blog posts, with a good many of them cross posted at the world’s most-viewed website on global warming and climate change, WattsUpWithThat. I’m probably best known for my research into the long-term impacts of major El Niño and La Niña events. I’m also known for my annotated graphs. Many persons will simply scroll down through those graphs before reading the content of the post, so feel free to do that. It should spark your interest. More on my findings later. First, let’s address the sleight of hand in “Climate of Doubt”. Initial note: The vast majority of the people watching “Climate of Doubt” were not scientists or statisticians. They were global warming laypeople. It should be a safe assumption on my part that laypersons were your intended audience. Therefore, in your presentation, the statistical significances of the trends in the surface temperature “escalator” were not important. It was only their appearances that mattered. In the last 10 years, there hasn’t been a warming. We don’t know why that is. But one doesn’t see any warming in the observations. There simply is no trend. JOHN HOCKENBERRY: No warming in the last 10 years? No long-term trend? Climate scientists would say that’s playing games with the data. ANDREW DESSLER, Climate Scientist, Texas A&M University: You can, if you want, very carefully select the end points of your time series, the starting month and the ending month, and you can come up with— maybe you can come up with something that shows no warming. JOHN HOCKENBERRY: In a sense, what Dessler saying is that you can do this at home. On a complex chart, depending on the beginning points X and ending points Y, you can select a trendline that does indeed show temperature going down. [on camera] Could I pick 10 years of world history and show a climate cooling? GAVIN SCHMIDT, Climate Scientist, NASA Goddard Institute: Oh, you could totally do that! In fact, you could take the entire climate history that we have in the instrumental record and you could find cooling trends every 10 years. GAVIN SCHMIDT: You pick the end points and you could find any particular year as part of a cooling year. But actually, the whole thing has been moving up. ANDREW DESSLER: If you look at all of the data, it’s quite clear that the warming is continuing. That portion of “Climate of Doubt” starts at about the 16:23 minute mark on YouTube edition here. 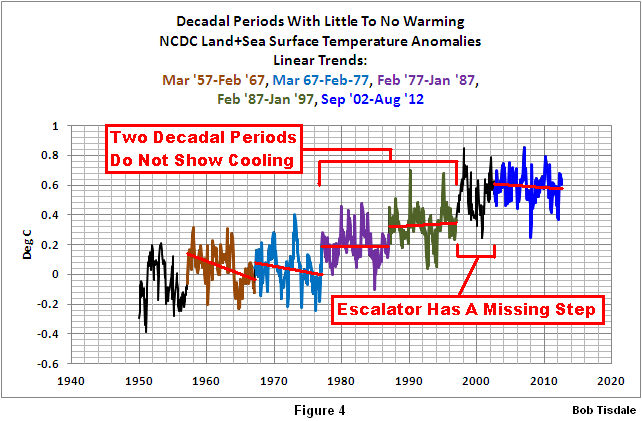 Curiously, 5 of the 7 periods illustrated in the Escalator graph were less than 10 years, yet this was presented in response to Fred Singer’s statement, “In the last 10 years, there hasn’t been a warming.” One of the periods on your graph appears to have only been 5.5 years. That’s a prime example of why people are very skeptical of climate science. It’s standard procedure for climate scientists to either redirect the discussion or to use misdirection, sleight of hand, when responding to specific comments. That happens all the time, even in peer-reviewed papers—example to follow. I’m not being nit-picky in any way. The specific period being discussed was 10 years—not 5.5 years, not 7 years—it was 10 years. 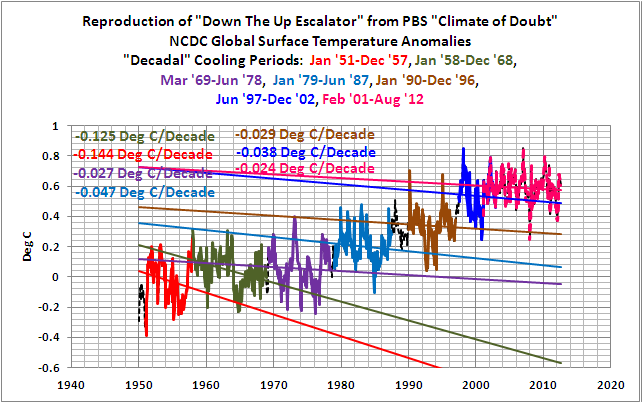 Note 1: To determine the periods of the “steps” in Figure 1, I replicated the escalator graph from “Climate of Doubt”. You had not presented the start and end dates of all the periods, so that left me to my own devices. Referring to the trend lines in the escalator graph (Figure 1), I attempted as best I could to reproduce those trends. The periods appeared to be January 1951 to December 1957 (84 months), January 1958 to December 1968 (132 months). March 1969 to June 1978 (112 months), January 1979 to June 1987 (102 months), skip 30 months, Jan 1990 to December 1996 (84 months), January 1997 to December 2002 (67 months), overlap 23 months, and February 2001 to August 2012. Please confirm the actual time periods with the party who created your graph. I might be off by a month or two—but not by 4.5 years. Note 3: The trend for the entire period of 1951 through 1976 is basically flat so it’s very easy to pick decadal cooling periods then. Very obviously, however, between 1976 and about 2001, it became increasingly difficult to find the 10-year cooling periods. Otherwise you would not have needed to skip more than 2 years of data and resort to periods of about 5.5 and 7 years for your trend lines. 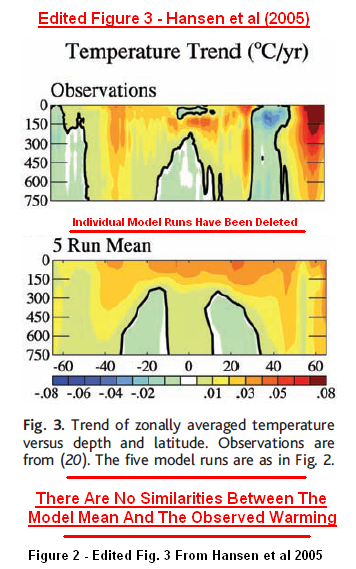 Figure 3 compares the latitude-depth profile of the observed ocean heat content change with the five climate model runs and the mean of the five runs. There is a large variability among the model runs, revealing the chaotic ‘‘ocean weather’’ fluctuationsthat occur on such a time scale. This variability is even more apparent in maps of change in ocean heat content (fig. S2). Yet the model runs contain essential features of observations, with deep penetration of heat anomalies at middle to high latitudes and shallower anomalies in the tropics. My Figure 2 is Figure 3 from Hansen et al (2005), with the five individual model runs removed. Visually compare the top profile, which is based on measured data, to the model mean at the bottom, which is the average of the 5 model simulations. The average of the simulations does not in any way “contain essential features of observations”. In reality, there are few if any similarities. But that’s climate science for you. They tell you one thing, but show you something completely different. In climate science, what is often passed through peer review is mind boggling. And some people wonder why there are climate skeptics. To paraphrase Gavin Schmidt, we’re not interested in the random component (noise) inherent in the individual simulations; we’re interested in the forced component, which represents the modeler’s best guess of the effects of manmade greenhouse gases. There is a large variability among the model runs, revealing the chaotic ‘ocean weather’ fluctuationsthat occur on such a time scale. …our coarse-resolution ocean model is unable to simulate climate variations associated with El Niño-Southern Oscillation processes. Therefore, the large variability among the GISS models in that paper result from “chaotic ‘ocean weather’ fluctuations” in the models, not something that exists in the real world. To sum up this note, John, we’re not “interested in a particular ensemble member”; we’re interested in the “best representation of a scenario”, which is why I removed the visual noise of the individual simulations from Figure 3 of Hansen et al (2005) in my Figure 2. 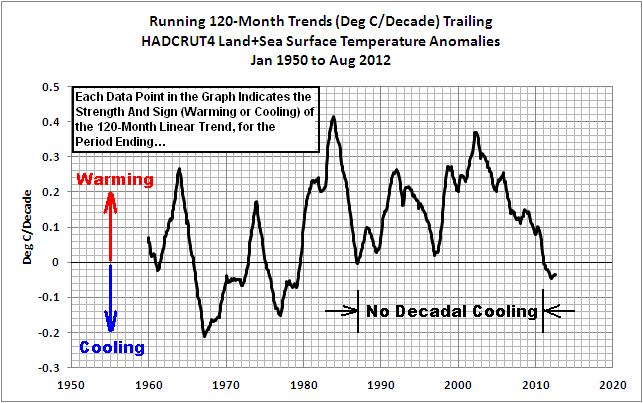 CAN YOU REALLY FIND A COOLING TREND EVERY 10 YEARS? In fact, you could take the entire climate history that we have in the instrumental record and you could find cooling trends every 10 years. That’s wishful thinking. We can determine how realistic this is by plotting, on a monthly basis, the values of the 120-month linear trends in Deg C per decade. See Figure 3. Each data point in the graph indicates the value of the linear trend for the 120-month period ending at a given month. That is, the data point at August 2012 represents the linear trend in Deg C per decade for the period from September 2002 to August 2012, and the data point before it represents the linear trend from August 2002 to July 2012, and so on, working back in time until the first data point at December 1959, which shows the linear trend for the period of January 1950 to December 1959. If the trend showed global temperatures cooled over a 120-month period, the trend value is negative, and vice versa for warming. The dataset in the graph is global land-plus-sea surface temperature anomaly data from the National Climatic Data Center (NCDC), same as yours, and starts in January 1950, as did yours, John, in “Climate of Doubt”. 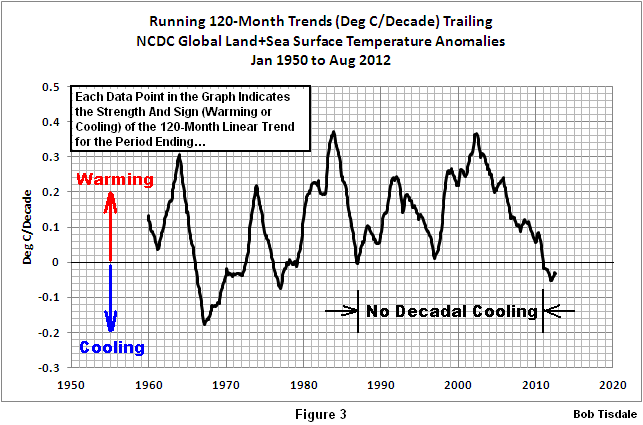 As shown, the 120-month (decadal) trends have been slightly negative since about 2011. In other words, global temperatures have been cooling—slightly. Working back in time, they came close to reaching a zero trend (no warming or cooling) for the period ending about January 1997, but they don’t quite reach it. That means we have to go back another decade, to January 1987, until we can see the decadal trends reach zero again, but they don’t drop appreciably below it. 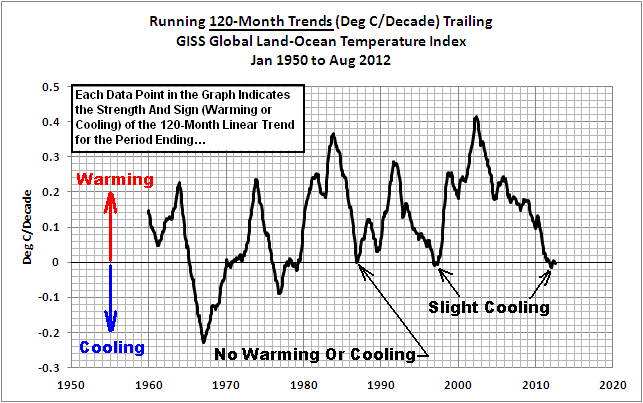 It’s not until the late 1970s that a significant decade-long cooling period exists. 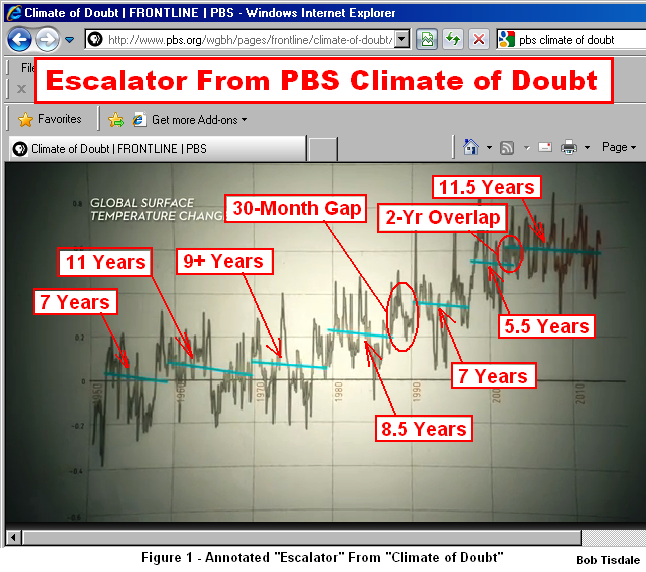 The bottom line: The escalator in “Climate of Doubt”, if you had actually presented 120-month trends, would not confirm Gavin Schmidt statement “…you could take the entire climate history that we have in the instrumental record and you could find cooling trends every 10 years.” See Figure 4. 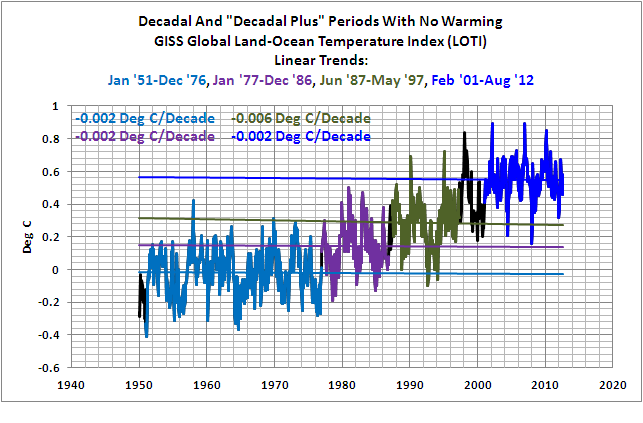 The decadal period ending in January 1997 shows a slight warming and the one ending in January 1987 is essentially flat. Additionally, the gap in the late 1990s to the early 2000s contradicts his statement. Now, it could be argued that the differences in the trends are not statistically significant, but, as noted earlier, the vast majority of your viewers were not be interested in statistics. They were interested in what the graph looked like. And wasn’t that why you presented the graph, for appearance sake? The problem was, if you had used actual 10-year periods, which was the topic of discussion, the “down the up escalator” visual effect would not have worked very well. Figure 4 is really not a bad representation of a step effect. It’s simply not the “down the up escalator” they described. Keep in mind, Fred Singer hadn’t used the word cooling in what you quoted. It was Gavin Schmidt who introduced decade-long cooling periods to the discussion. As mentioned above, we can get reasonable step results with the GISS data. In fact, because the GISS Land-Ocean Temperature Index data does actually reach zero in 1997, we can actually prepare a nice-looking graph using trends for 120-month, and longer (not shorter) periods. See Figure 5. (The actual trend values are presented in a graph here.) It still has the gap in the late 1990s to early 2000s, but the climate scientists you interviewed could have presented it, no problem, without having to resort to misdirection and redirection. The period from 1951 to 1976 is much longer than 10 years, and they could have exploited that. And the last period is also a little longer than a decade. They could have noted that as well, saying it’s not unusual to have decadal periods and even longer periods with no warming. Why didn’t they? In a press conference or debate, whenever a candidate uses misdirection in response to a question, the press grasps hold of it immediately and belittles the candidate. Why isn’t the mainstream media doing that with climate scientists, John? Look at the break points in Figures 4 and 5. 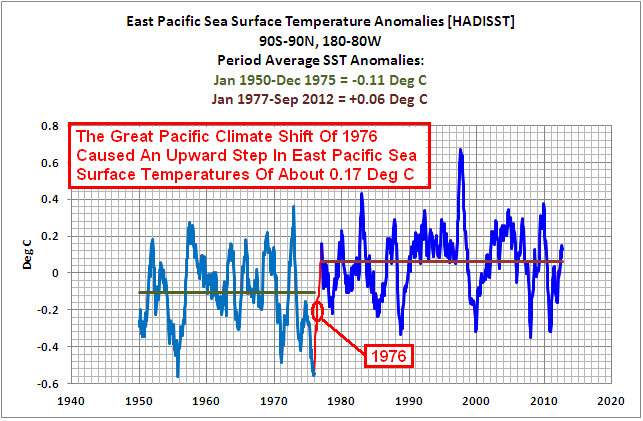 There’s one in 1976 that corresponds to the Great Pacific Climate Shift of 1976. That natural phenomenon effectively shifted the surface temperature of the entire Eastern Pacific Ocean (about 33% of the surface area of the global oceans) up about 0.17 deg C. In Figure 5, you can see its impact very clearly now that you know it exists. The Great Pacific Climate Shift also refers to the change in the basic state of the ocean processes taking place in the tropical Pacific. After 1976, El Niño events dominated, but for the period from the early-1940s to 1976, El Niños and La Niñas were more evenly matched, with La Niñas just a little bit stronger. Looking again at Figure 5, there are two more break points. They occurred at 1987 and 1997, both of which correspond to the monstrous, but naturally occurring, El Niño events of 1986/87/88 and 1997/98. El Niño was such an important topic of discussion in the late 1990s that the National Oceanographic and Atmospheric Administration (NOAA) created a number of websites about them. Refer to an example called The ENSO Cycle. 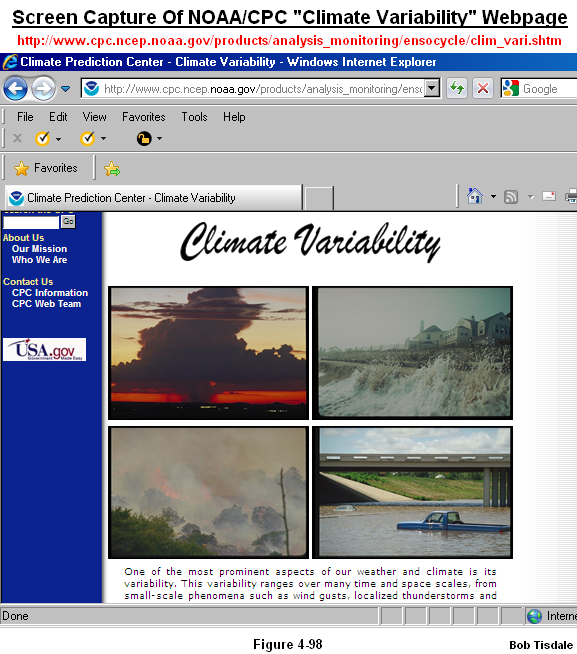 The El Niño-based webpage contains the link to one titled Climate variability. See the screen capture here. Note the photos—what some would now call climate catastrophes. In the late 1990s, weather events were responses to Mother Nature’s handiwork. A few years later, climate scientists must have become tired of being upstaged by her, so those alarmist scientists took possession of weather and began blaming thunderstorms, beach erosion, wildfires, floods, drought, snowfall, hurricanes, tornadoes, you name it, on greenhouse gases. That nonsense is running amok now. Sea surface temperatures along Hurricane Sandy’s track haven’t warmed in 70+ years; in fact, they’ve cooled in the extratropical portion; yet alarmists had the gall to blame Sandy on manmade global warming. Back to Figure 5: Those break points and upward shifts in Figure 5 do have natural causes and they make themselves known very well with the 10-year trends. 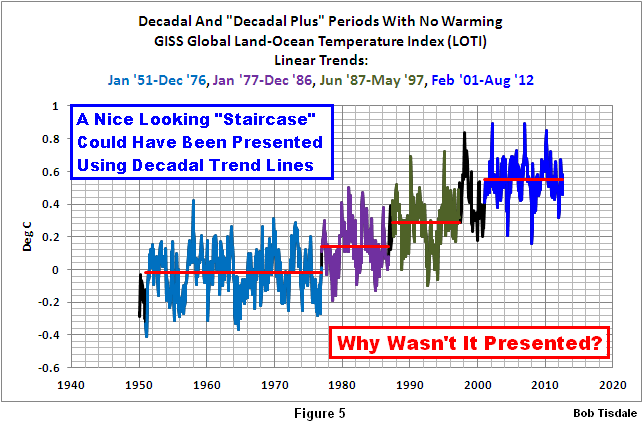 One might assume the climate scientists were trying to hide those naturally caused upward shifts when they avoided using decadal periods in the escalator graphic. The following heading indicates what they were hiding. You may find that hard to believe, John, but read on. It’s blatantly obvious. There’s no need for statistics. No need for models. Anyone who can read a graph can see it. A little bit more about my background: I am the independent researcher who—fortunately or unfortunately, depending on your viewpoint—discovered there is no evidence of a manmade warming component in satellite-era sea surface temperature data or in ocean heat content data, the latter of which relies on ocean temperature measurements to depths of 700 meters (about 2300 feet). More specifically, while the global oceans have warmed, the data indicates they warmed naturally; that is, there is no indication that greenhouse gases played any part in the ocean warming. That’s not surprising. Infrared radiation from manmade greenhouse gases can only penetrate the top few millimeters of the ocean–at the skin where evaporation takes place. Based on the following data presentation and discussion, it appears as though the additional infrared radiation must simply evaporate a little more water from the surface. Further, because the vast majority of the warming of global land surface air temperature is in response to the natural warming of the global oceans, there is very little overall impact of greenhouse gases on land surface air temperatures as well. The following is a short version of my standard presentation about the natural warming of the global oceans. I’ve added a few new graphs and discussions here to shorten it. Figure 6 is a graph of the sea surface temperature anomalies for the global oceans during the satellite era, which started in November 1981. This sea surface temperature dataset from NOAA is called the Reynolds Optimum Interpolation sea surface temperature dataset, version 2, a.k.a. Reynolds OI.v2. It’s used by GISS in their Land-Ocean Temperature Index data. In a 2004 peer-reviewed paper, Smith and Reynolds called this sea surface temperature dataset “a good estimate of the truth.” (See page 10 of the paper.) It’s the best sea surface temperature dataset that’s available. It shows the sea surface temperatures of the global oceans warmed about 0.26 deg C or 0.47 deg F over the past 30 years. That’s a period the climate models employed by the IPCC say only greenhouse gases can explain the warming. The data contradicts them. And it’s so obvious you’ll wonder how they’ve overlooked this. Maybe they haven’t. Maybe the IPCC has elected not to be forthcoming about it. Figure 7 is a graph of the measured sea surface temperatures for the East Pacific Ocean, reaching from pole to pole and from the dateline to the Isthmus of Panama (90S-90N, 180-80W). What do you see in that graph, John? The large upward spikes are caused by El Niño events and downward ones are caused by La Niña events. (In case you’d like to confirm that, click here for a graph that compares the East Pacific data to a commonly used index for the strength, frequency and duration of El Niño and La Niña events. 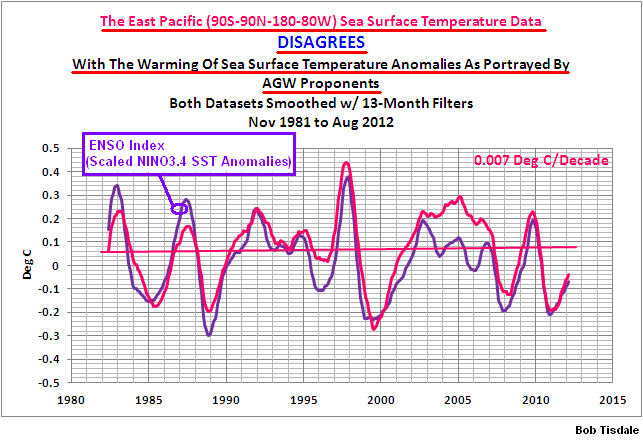 The East Pacific sea surface temperature anomalies mimic the variations in the El Niño/La Niña index. ) Notice the linear trend in Figure 7. It’s a miniscule 0.007 deg C/decade. 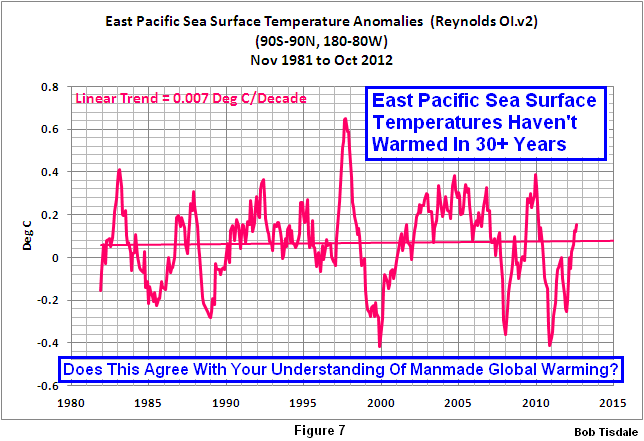 Basically, the sea surface temperature anomalies of the East Pacific have not warmed in 31 years. That data represents about 1/3 of the surface of the global oceans. It’s not a small portion. Further, if we were to correct that dataset for the biases caused by the cooling that took place in response to the explosive volcanic eruptions of El Chichon in 1982 and Mount Pinatubo in 1991, the sea surface temperatures for the East Pacific Ocean would show cooling for the past 30 years. Does that agree with your understanding of global warming? The IPCC’s climate models say the surface of this part of the global oceans should have warmed 0.42 to 0.44 deg C or about 0.7 to 0.8 deg F. Maybe your understanding of global warming is based on the models, not the data. One might guess that’s true for many people. Figure 8 is a graph of the sea surface temperature anomalies for the Rest of the World—the Atlantic, Indian and West Pacific oceans. The coordinates are 90S-90N, 80W-180. This dataset cover about 67% of the surface area of the global oceans. The responses of this dataset to the very strong El Niño events of 1982/83, 1986/87/88, 1997/98 and 2009/10 are highlighted in red. The dip and rebound starting in the early 1990s was caused by the colossal eruption of Mount Pinatubo in 1991, and the eruption of Mexico’s El Chichon in 1982 counteracted the response of the Rest-of-the-World data to the 1982/83 El Niño. Other than that, what do you see in the graph, John? What I see: the only times the sea surface temperatures warmed was during the major El Niño events. Or looking at it in another way, the sea surface temperatures did not warm between those El Niño events. We can confirm that by removing the upward shifts in the data caused by the highlighted El Niño events and replace that data with flat lines. See Figure 9. 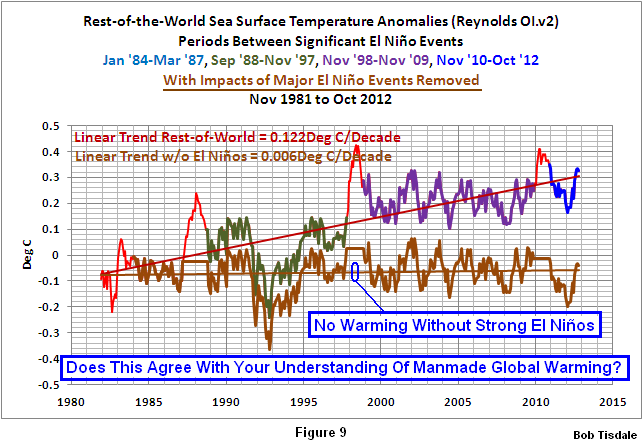 Without those El Niño events, the Rest of the World sea surface temperatures would not have warmed in over 3 decades. 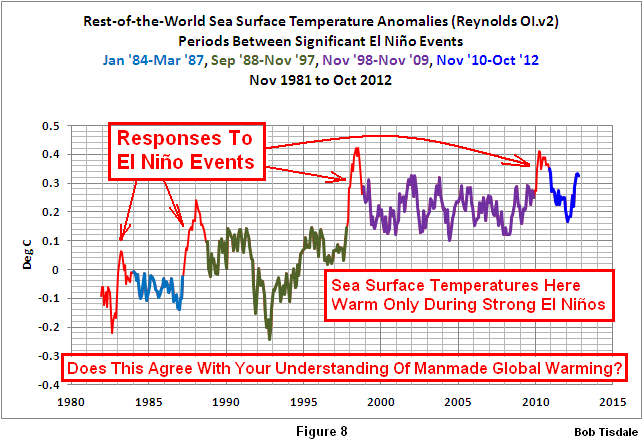 Is that your understanding of global warming, that the warming of sea surface temperatures occurs only during El Niños? 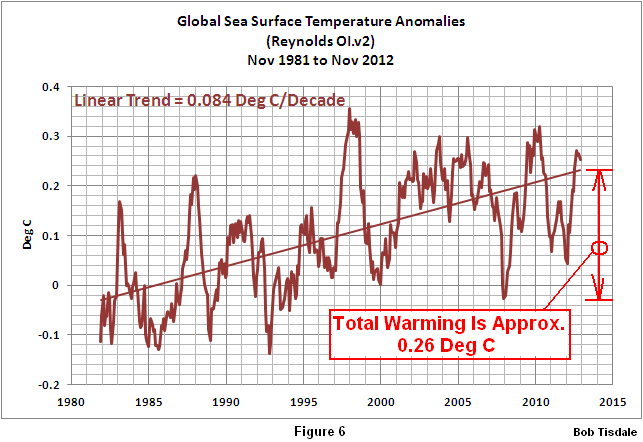 The question now: Why do the sea surface temperatures warm for this part of the globe? 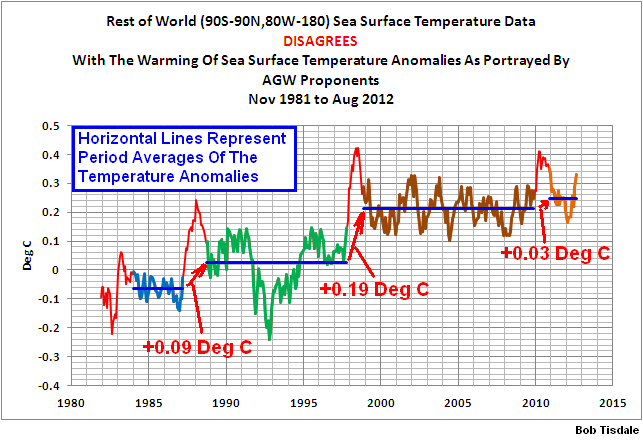 The answer can be seen if we remove the trend of the sea surface temperature data for the Rest of the World. (Here’s a graph that illustrates and describes detrending.) In Figure 10, I’ve compared the detrended Rest-of-the-World data to a scaled version of the dataset that represents the frequency, magnitude and duration of El Niño and La Niña events. The first and third major divergences between the two datasets are caused by the response (cooling) of the sea surface temperatures to the eruptions of El Chichon and Mount Pinatubo. The second and fourth divergences are different. 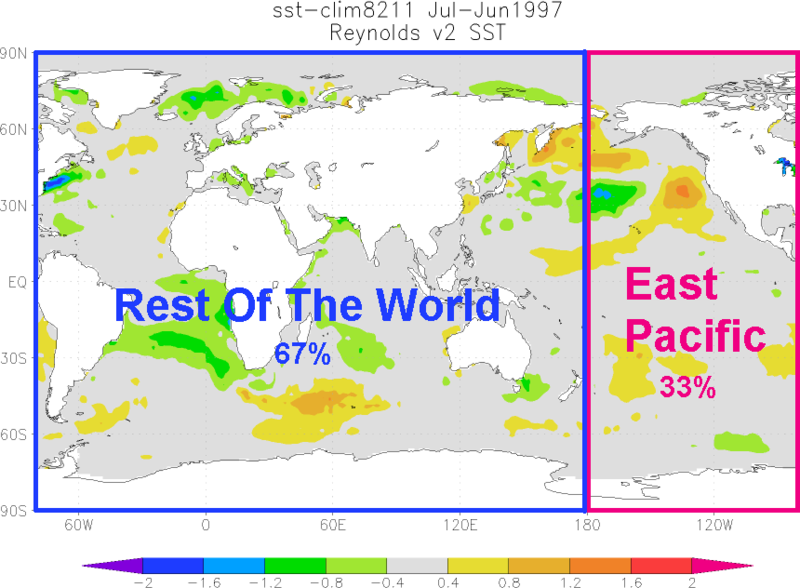 The Rest-of-the-World data remains warmer than the scaled ENSO index; in other words, the Rest-of-the-World data does not cool proportionally during the La Niña events that followed the major El Niños of 1986/87/88 and 1997/98. 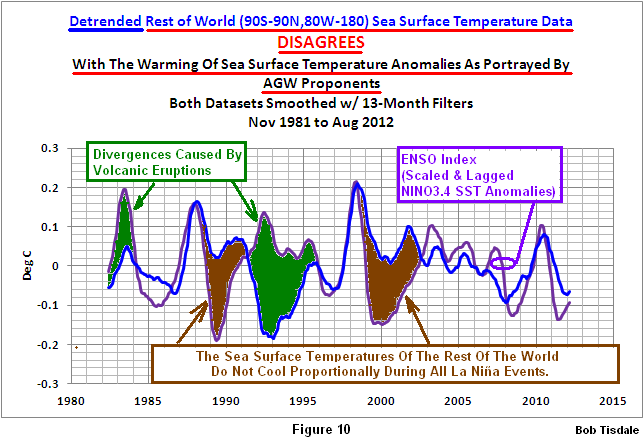 We can see the Rest-of-the-World sea surface temperature anomalies warmed in response to the 1986/87/88 and 1997/98 El Ninos, but they did not cool fully during the 1988/89 and 1998-2001 La Niñas. Is that your understanding of how El Niño and La Niña events work? Because there’s no warming without the El Niño events, Figure 8, one might also assume the sea surface temperatures for the Rest-of-the-World subset would show no warming if that dataset cooled proportionally during those anomalous La Niñas. That is, if the Rest-of-the-World sea surface temperature data cooled proportionally during the La Niña events, they would also show no long-term warming similar to the East Pacific Ocean in Figure7. Back to my last question, which was: Is that your understanding of how El Niño and La Niña events work? We’ve been told for years that global temperatures warm during El Niños and that they cool during La Niñas. In reality, only about 33% of the global oceans respond that way. Some climate scientists—those who have become nothing more than climate activists—represent that La Niñas oppose El Niños and that their impacts on global temperatures are proportional. That’s why they treat El Niños and La Niñas as noise and attempt to remove their effects through statistical analyses. An example of this misrepresentation of El Niño and La Niña is the peer-reviewed paper Foster and Rahmstorf (2011). There are many more papers that misrepresent El Niño and La Niña, including the IPCC’s upcoming 5th Assessment Report. In reality, based on the processes that govern La Niña and El Niño events, and based on the instrument temperature record, those processes are best viewed as a recharge-discharge oscillator, not simply as cyclical warming and cooling in the eastern tropical Pacific. The recharge-discharge oscillator process was proposed in the 1997 paper “An Equatorial Ocean Recharge Paradigm for ENSO”, Part I and Part II, authored by Fei-Fei Jin. It was subsequently incorporated into the unified ENSO oscillator theory discussed in Chunzai Wang’s 2001 paper On ENSO Mechanisms. Looking at El Niño and La Niña as a recharge-discharge oscillator is nothing new, but it took a blogger to show its impacts on global surface temperatures. A brief overview of how La Niña and El Niño relate to a recharge-discharge oscillator: During La Niñas, tropical Pacific trade winds are stronger than normal. This pushes aside cloud cover and allows more sunlight to enter and warm the tropical Pacific to depths of about 100 meters—with the majority of the warming taking place closer to the surface. Trade wind-driven ocean currents carry the sun-warmed water to the west where it pools to depths of 300 meters (about 1000 feet) in an area of the western tropical Pacific appropriately called the west Pacific Warm Pool. That’s the simple explanation of the recharge phase. El Niños, the discharge phase, release that warm from below the surface of the west Pacific Warm Pool and spread it across the surface of the eastern tropical Pacific. With that warm water covering more of the surface, more heat than normal is discharged into the atmosphere through evaporation. The El Niño does not consume all of the warm water. After the El Niño, the leftover warm water is redistributed from the tropical Pacific. The divergences during the 1988/89 and 1998-01 La Niñas shown in Figure 10 are caused by the warm water that’s left over after the major El Niño events that preceded them. That’s why the El Niño events of 1986/87/88 and 1997/98 appear to create the upward shifts in the sea surface temperatures for the Atlantic, Indian and West Pacific Oceans (the Rest-of-the-World data in Figure 8). The recharge and discharge phases are visible in the Ocean Heat Content data for the tropical Pacific (24S-24N, 120E-80W), Figure 11. This dataset was created and is maintained by the National Oceanographic Data Center (NODC), a division of NOAA. The data begins in 1955. The dataset is composed primarily of temperature measurements to depths of 700 meters, or about 2300 feet. Because salinity measurements are also used to calculate ocean heat content, the dataset is presented in Joules. In the following graphs, the units are Gigajoules per square meter (GJ/m^2). There are 3 periods highlighted in red in Figure 11. Those are the 3-year La Niña events that served as the primary sources of warm water for the numerous El Niños that followed them. The lesser La Niña events that trailed individual El Niños are not identified. 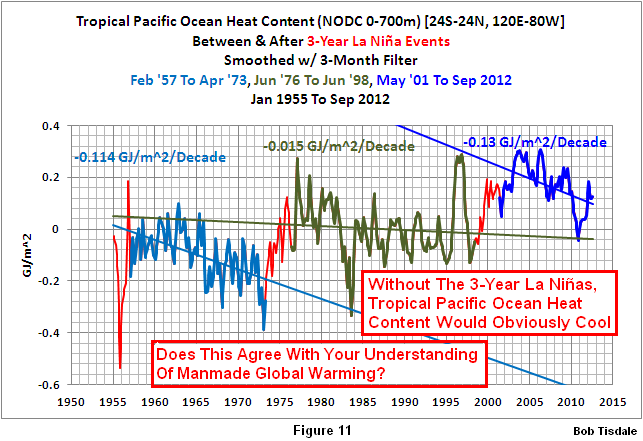 Notice how the Ocean Heat Content for the tropical Pacific cools between the 3-year La Niñas. This indicates the lesser La Niña events that trailed the El Niños typically only recharge some, but not all, of the warm water discharged and redistributed by the El Niños. Also note the upward spike in the late 1990s. 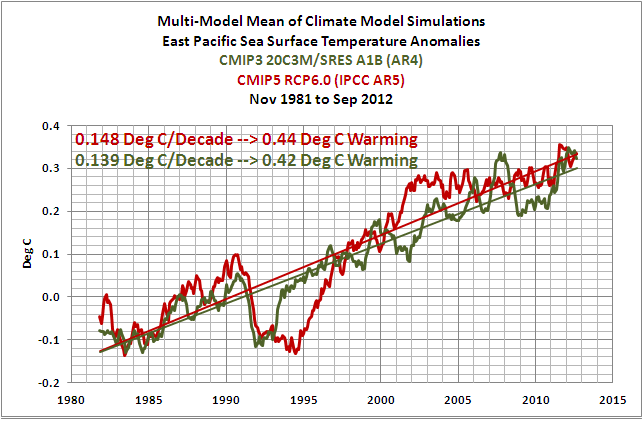 The leading edge, the warming, is the tropical Pacific’s response to the 1995/96 La Niña. That La Niña was relatively weak by most standards. There were, however, very strong trade winds in the western tropical Pacific that caused that build-up of heat (by reducing cloud cover and allowing more sunlight to warm the tropical Pacific to depth). See McPhaden 1999 The Evolution of the 1997/98 El Niño. The freakish 1995/96 La Niña created the warm water for the 1997/98 El Niño, which in turn caused the sea surface temperatures of the Atlantic, Indian and West Pacific oceans to shift upwards approximately 0.19 deg C (Refer to the period-average sea surface temperatures for the Rest-of-the-World here). The 1995/96 La Niña, effectively, also caused an upward shift in the ocean heat content for the tropical Pacific, which means it skewed the trend line for the middle period in Figure 11. Click here for a graph that shows how strongly the ocean heat content of the tropical cooled between the 1973-76 La Niña and the 1995/96 La Niña. Does that graph, with the multidecadal cooling periods, agree with your understanding of the warming of the global oceans, John? It’s difficult to claim that manmade greenhouse gases had any impact on the Ocean Heat Content of the tropical Pacific when it cools for multidecadal periods between major La Niña events. That same problem with the hypothesis of manmade global warming exists in the ocean heat content data for the North Pacific, north of the tropics (24N-65N, 120E-80W). See Figure 12. 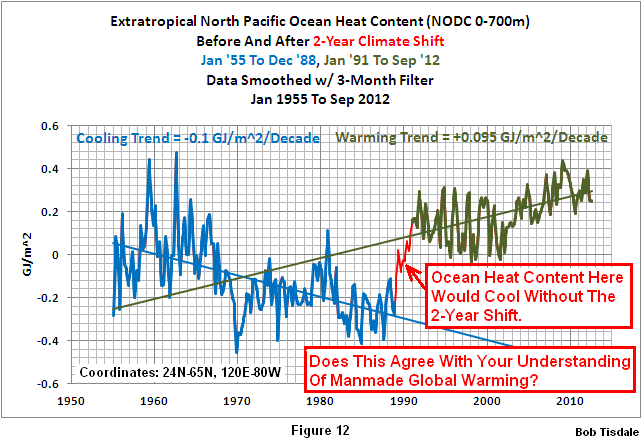 For it, I’ve isolated and highlighted in red an upward shift in ocean heat content that occurred in 1989 and 1990. Before that shift, the ocean heat content for the North Pacific cooled at a significant rate. Obviously, there’s no visible impact of greenhouse gases during that period. After the shift, it warmed. Notice how the cooling and warming rates before and after the shift are basically the same. The cooling period lasts longer than the warming period, and that means, if the effects of the upward shift in 1989 and 1990 were removed from the data, the ocean heat content for the North Pacific would cool over the entire term. If you’re wondering, it’s very easy for Mother Nature to create a 2-year shift in ocean heat content like the one shown in Figure 12. Before the shift, the North Pacific was losing heat faster than it was gaining it. That’s pretty obvious. That likely indicates the wind patterns there were allowing warm water to be carried poleward from the tropics, where it could be released to the atmosphere and space more readily, and that the rate of transport was such that the heat released was greater than the amount of warm water being supplied from the tropics. Then in 1989 and 1990 there was a change in wind patterns that resisted that poleward transport and the warm water from the tropics simply backed up and accumulated. That’s all it would take. Curiously, even though this dataset has been available for a number of years, I have yet to find a scientific paper that addresses that obvious climate shift in the ocean heat content of the North Pacific. Is that your understanding of manmade global warming, John? 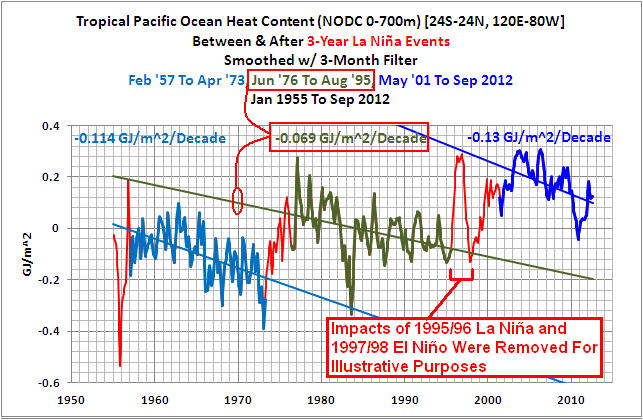 That the warming of the ocean heat content for the tropical Pacific relies on naturally occurring La Niña events? That it relies on a freak of nature, a weather event, like the 1995/96 La Niña? That the warming of ocean heat content for the North Pacific relies on an upward shift during a 2-year window in order to show warming? My guess: that’s not you understanding of manmade global warming. My guess is that you’ve only seen graphs of the relatively continuous warming—one presented by climate scientists using GLOBAL ocean heat content. We’ve seen in Figures 11 and 12 how the ocean heat content for the tropical Pacific and for the North Pacific, north of the tropics, do not confirm the existence of a manmade global warming signal. Watch what happens when we combine those two datasets. The ocean heat content for the Pacific Ocean north of 24S (24S-65N, 120E-80E) is compared to ocean heat content for the global oceans in Figure 13. Now the data seems to support the global warming hypothesis. 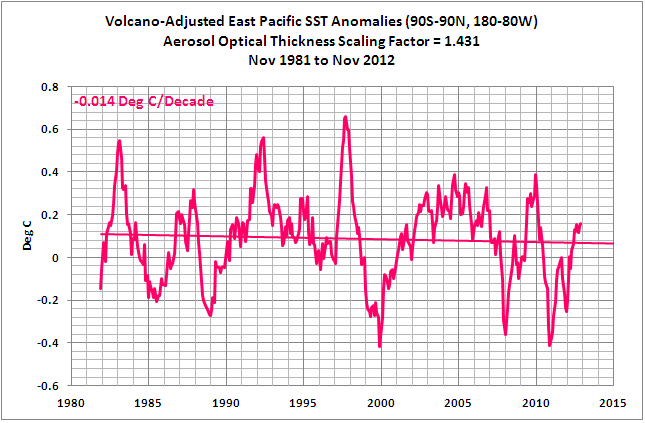 The Pacific subset is much more volatile, but it follows the same basic long-term variations. The Pacific data has a slightly lower long-term trend than the global data, but that difference is caused by the extra natural variability of the North Atlantic. 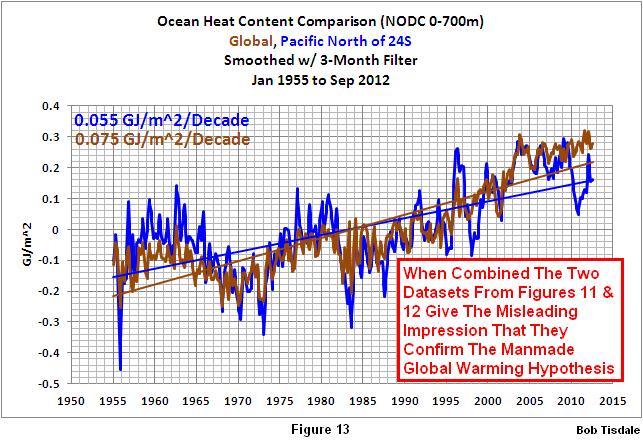 All in all, the ocean heat content data for the Pacific Ocean north of 24S (Figure 13) gives the misleading impression of relatively continuous warming—and seems to confirm the existence of manmade global warming. On the other hand, when we break the Pacific data down into two logical subsets (Figures 11 & 12), the data contradicts the hypothesis of manmade global warming. The hypothesis of manmade global warming is, therefore, fatally flawed. It was built on a poor foundation. It is not supported by ocean heat content data (Figures 11 and 12) and it is not supported by sea surface temperature data (Figures 7 to 10). 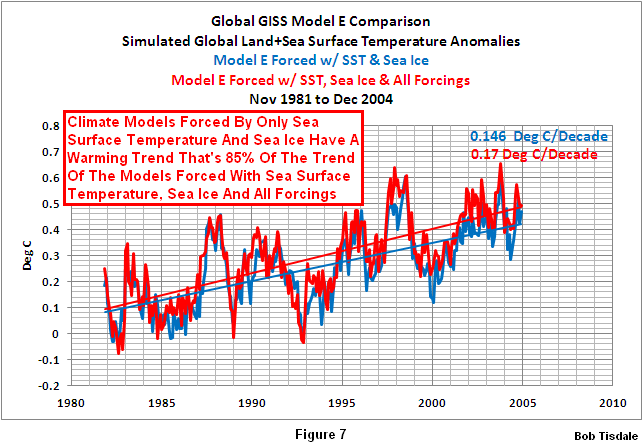 Is your understanding of global warming based on data or climate models? I’ve been presenting the long-term effects of El Niño and La Niña events in scores of blog posts over the past 4 years, and as noted in the introduction, many of those blog posts have also appeared at the world’s most-viewed website on global warming and climate change, WattsUpWithThat. Tens of thousands of people have read them and are aware of the basic flaws in the hypothesis of manmade global warming. I’ve explained, illustrated, animated and documented with data the processes of El Niño and La Niña events—and their impacts on the long-term warming of the global oceans. I’ve also been presenting the ocean heat content for the tropical Pacific and the North Pacific north of the tropics ever since the Royal Netherlands Meteorological Institute added the NODC’s dataset to their KNMI Climate Explorer more than 3 years ago. Anyone with internet access and spreadsheet software can confirm what’s presented in this post. 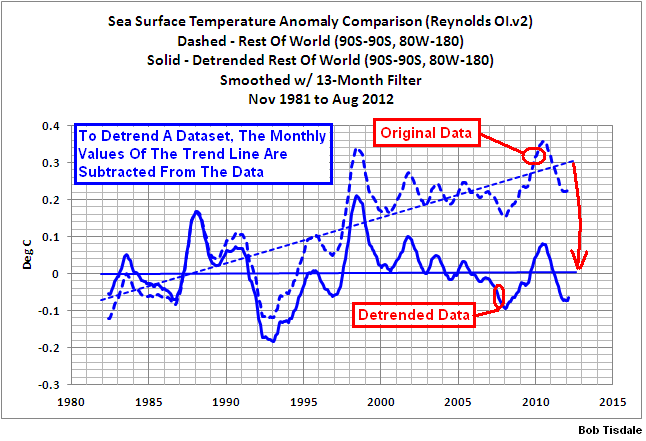 The Reynolds OI.v2 sea surface temperature data presented herein is available through the NOAA NOMADS website. The NODC ocean heat content data for 0-700 meters is available through the KNMI Climate Explorer. That website also includes the Reynolds OI.v2 data in an easier-to-use format. The GISS, UK Met Office/Hadley Centre and NCDC land-plus-sea surface temperature data are also available through the KNMI Climate Explorer, or through their respective websites: here for GISS, here for UK Met Office, and here for NCDC. This memo briefly introduced a significant problem with the climate science community. Instead of providing objective answers, they often give misleading ones or offer replies intended to misdirect. The climate scientists who have taken on the roles of alarmists and activists rely on the public’s inherent trust in them. The public depends on climate scientists for the truth, but what they often get in return is much less than that. In order to perpetuate the faulty hypothesis of manmade global warming, the scientists/activists also rely on the simple fact that the public does not have the time, inclination or background to verify the accuracy of what they’re being told. Enter climate skeptics with data. The proponents of anthropogenic global warming then respond with excuses, misdirection, redirection and outright falsehoods—and when they’re really desperate, they rely on name calling. You may view the escalator discussion as trivial. It’s not worth arguing about. It served as the introduction to the major problem with the manmade global warming hypothesis and that was, the hypothesis doesn’t work for sea surface temperature and ocean heat content data. I have to ask you something. Were you aware the satellite-era sea surface temperature data and the ocean heat content data do not support the hypothesis of manmade global warming, John? I’ve been discussing this for 3 to 4 years. What I’ve presented is blatantly obvious. Anyone who can read a graph can see it. And if you were to take a couple of minutes you can watch an animation of global sea surface temperature anomaly maps with an infilling graph to its right and see the sea surface temperatures shift upwards in response to the warm water that’s left over from the 1997/98 El Niño. If you’re still skeptical of the existence of warm water left over after an El Niño, you can watch a small portion of a video from JPL that illustrates sea level residuals—more satellite-based data—which I’ve converted into a gif animation. It shows a portion of that leftover warm water. It’s also very difficult to miss. Quite plainly, you can see a huge volume of warm water being returned to the western tropical Pacific at the end of the 1997/98 El Niño. Watch what happens when that phenomenon called a slow-moving Rossby wave reaches Indonesia. It’s like a secondary El Niño event taking place in the western tropical Pacific, but it’s happening during the La Niña. All of that leftover warm water counteracts the effects of the La Niña throughout the globe. 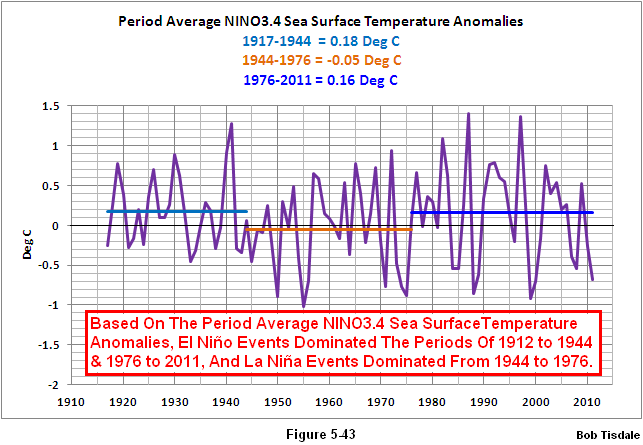 It causes the divergences during the La Niñas that follow the major El Niño events (Figure 10). The YouTube edition of the full animation from JPL is here. Someday, the mainstream media will examine the instrument temperature record in logical subsets as I have done and they’ll understand the significance. They’ll then ask climate scientists about the conflicts with the hypothesis of manmade global warming and realize the answers they’re getting are excuses, misdirection, redirection and outright fabrications. There are blatantly obvious conflicts between the ocean temperature data and the hypothesis of manmade global warming, John. If, for political reasons, you’d prefer not to report on these conflicts, please email your associates who you believe might be willing to address them. If you have any questions, feel free to ask them at my blog. If you would prefer that I not post your questions, I could then reply to you via email. While you’re at my blog, have a look around. I’m sure you’ll find the comparisons of climate model outputs and measured temperature data very enlightening. Refer to the posts here, here, here and here. The climate models used by the IPCC show no skill at being able reproduce the global temperatures of the past. Why would anyone believe their projections of future climate are credible? Last, if you’re wondering, I’m not supported financially by any industry. My funding comes solely from book sales and from rare donations/tips through PayPal, both of which are much appreciated. This entry was posted in CAGW Proponent Arguments, El Nino-La Nina Processes, Model-Data Comparison SST. Bookmark the permalink. You wrote: “You’re probably wondering who I am”. Thanks for that thought, Brent. But I’m hoping Fred Singer will send John Hockenberry a link. I sent Fred a draft a few days ago, but haven’t heard back from him. Considering it’s the holidays, I don’t find that surprising. I suspect John Hockenberry will eventually get the message that the source is credible, all I do is plot publically available data, and that he’ll read it in time. But I would suspect he’ll never prepare a report about it, since it undermines a political agenda. Keep in mind, “Climate of Doubt” was a special political report, not a science report. Brilliant as always, What needs to happen is that PBS need to do an indepth piece on your work. From an outsiders (New Zealanders) perspective the programme was interesting in the insight it gave to the wider political agendas and the effect that has had on the overall political scene in Washington. While it was recognisable from afar it comes into sharp focus in the documentry. Your hope for some response from JOHN is I fear faint. It is the nature of the beast (journalism) that they are driven by an event or programme immediacy and immediately it is finished jump to the next event and focus on that. While your explanarions are of the highest quality, scientific rigour and simplicity of explanation it is unfortunately a fact that few of the public (miniscule number is probably a better discription) have the ability to understand even your (for the layman) explanation. I’m not sure that more than 10% of our politicians would have enough science without having a scientist sitting beside them to explain the significance. While it is obvious to us as the programme rightly pointed out the public can’t comprehend and that is what the AGW people rely on. Sent a tweet of your blog via the WUWT link straight to Frontline and John Hockenberry, with hashtags applied to the words “climate” and “Frontline” for good measure. My own WUWT guest post “Rebuttal to Frontline that PBS Ombudsman Won’t Put Online” http://bit.ly/SCSS6w pales in comparison since I have no science expertise, but when you add my point as a common citizen, yours, plus all those critical questions that Frontline itself mentioned https://twitter.com/frontlinepbs/status/261578327117148160 , it ought to make Frontline a bit more uncomfortable. I’ll have to start tweeting one of these days. Very cool of you to respond. I will look in the sites you provide to check it out. Pingback: On Hartmann and Wendler 2005 “The Significance of the 1976 Pacific Climate Shift in the Climatology of Alaska.” | Watts Up With That?